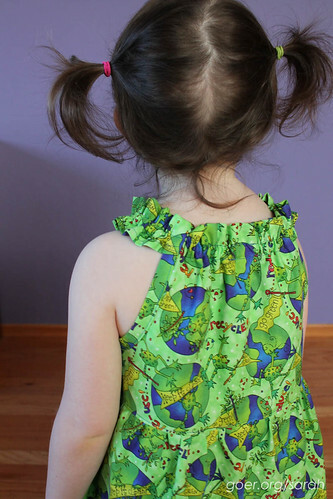 I think this is a great beginner pattern with just one piece of elastic in casing and nothing too picky to fiddle with. 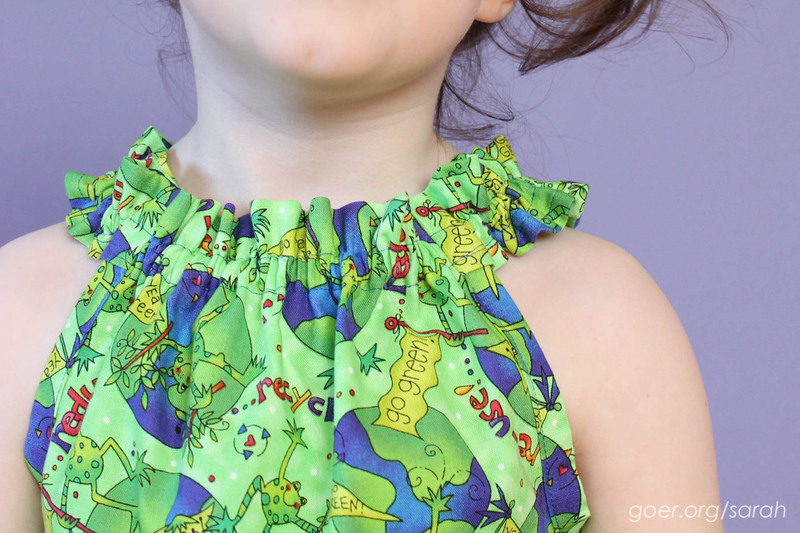 Posted in Kid Stuff, Sewing on December 17, 2015 by sarah. That's adorable! To be honest, I'd also like one in my size, in a different fabric! So cute! I look forward to seeing it on the playground. Cute!! What does the little one think? Oh - I remember having a little girl and boy to sew for! Way back when, but it was a lovely time in this Mum's life. I know they won't always be excited and eager to wear clothes I've made for them. I'm certainly enjoying it for now. Thanks for visiting, Jenny. The fabrics they pick are the outfits they'll WEAR. Your daughter is asserting her tastes. Go little one! This is a great dress. Your daughter looks so cute in it, with her hands on her hips. 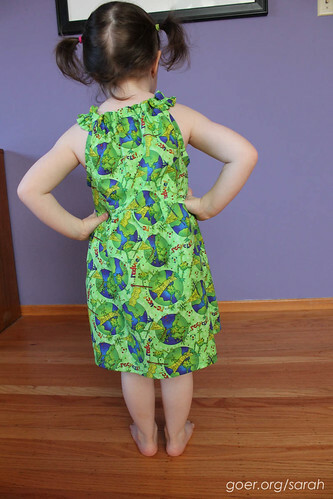 I miss sewing for my daughter. I actually sewed a lot for my boys too. Now she only wears leggings, jeans and flannels. Oh well. 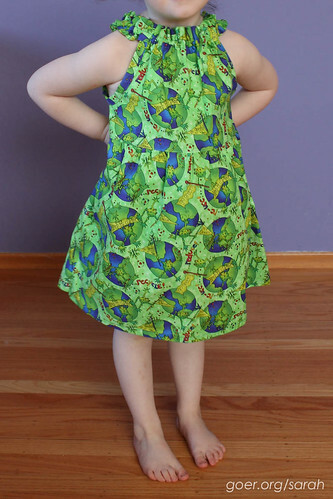 I love this pattern and it looks like she will be able to wear it for a very long time. Perfect. Leggings and flannels just wouldn't be as much fun to make. I've sewn shorts, pants and bowling shirts for my son. I feel like I need to venture into fabric other than 100% cotton woven to expand my options for him. Any particular boys clothing you recommend I try? It suits her bunches and all! 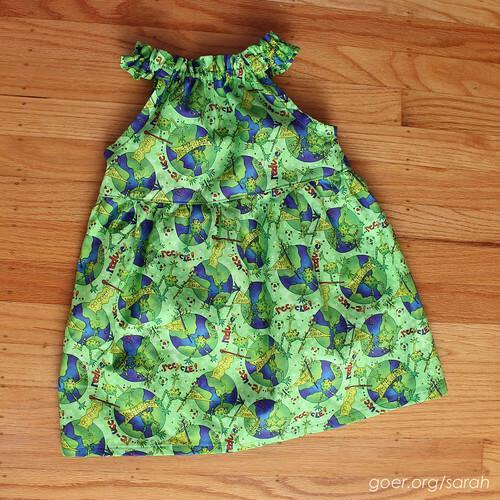 Cute frogs might not be the look you are after but maybe you could add pockets and use it as lining? Thank you for participating in the FAL, on behalf of the 2016 global FAL hosts. The pockets! What a fun way to sneak in a crazy print. Thanks for the idea!